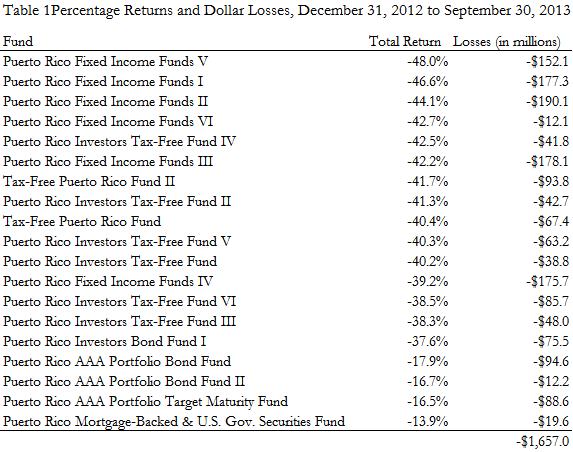 The 19 closed-end bond funds managed by UBS Puerto Rico listed in Table 1 lost $1.66 billion in the first 9 months of 2013. These funds were sold almost exclusively to citizens of Puerto Rico and approximately 70% of the portfolios of these funds were invested in Puerto Rican securities. The percentage losses over the past year range from 38% to 48% for the worst-performing UBS PR funds. These losses are substantially greater than Puerto Rican municipal bonds generally. The Standard and Poor’s Municipal Bond Puerto Rican Index was down 17% over the same period. SLCG previously posted two blog entries on the collapse of UBS’s Puerto Rico municipal bond. Our October 7, 2013 post, Trouble in Paradise: UBS Puerto Rico Bond Fund Investors Hit Hard, reported on losses in closed end municipal bond funds managed by UBS Asset Managers of Puerto Rico and sold by UBS brokers in Puerto Rico. Then on December 18, 2013 in our Did UBS Charge its Proprietary Puerto Rico Bond Funds Excessive Markups? we identified one of the ways in which the extensive conflicts of interest at UBS affiliated companies in Puerto Rico might harm investors in these bond funds. In this post we want to point out the effect a lack of diversification had on losses in the funds. UBS’s closed end funds were investment companies registered under the Puerto Rican Investment Company Act but were not diversified investment companies. This lack of diversification led to the losses borne by investors in these funds. The Puerto Rico Investment companies Act place restrictions on the degree to which investment companies can hold concentrated portfolios. The Act specifies two categories of funds depending on the level of diversification: diversified and non-diversified funds. Diversified funds can invest no more than 5% of the portfolio in securities from a single issuer. The Act allows funds to hold more than 5% of the portfolio in securities of a single issuer, however such funds are specifically labeled as non-diversified by the Act. Even for funds that are non-diversified, there is a limit to the concentration allowed by the Act. A non-diversified fund may not invest more than 25% of the portfolio in a single issuer. 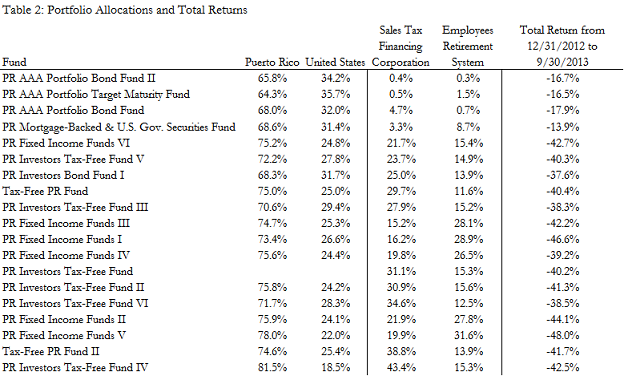 Table 2 sorts the UBS Puerto Rico funds by the fraction of the portfolio invested in the Sales Tax Financing Corporate and the Employees Retirement System. The first four funds held only 5.2% of their portfolio in these two issuers and had losses of 16.3% on average, in line with the broad Puerto Rican municipal bond market. The remaining funds had 46.8% of their portfolios invested in the two issuers and suffered losses of 41.6% on average. In our proprietary research, we model the general mathematical relationship between the expected losses of investors holding a closed-end fund and the leverage and concentration of the fund. For the UBS PR funds specifically, we demonstrate a strong cross-sectional statistical relationship between the level of losses experienced in each of the UBS PR funds and the concentration they exhibited. Further, we demonstrate that the losses emanated from concentration in fixed income issues that were originally brought to the market by UBS as underwriter.